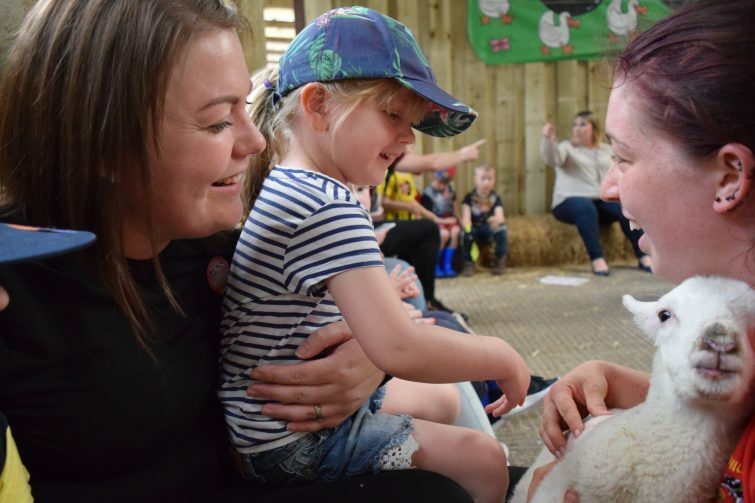 Smithills Open Farm near Bolton is a family run business with over 25 different types of animals – from cows, pigs and sheep to owls, llamas and pythons! 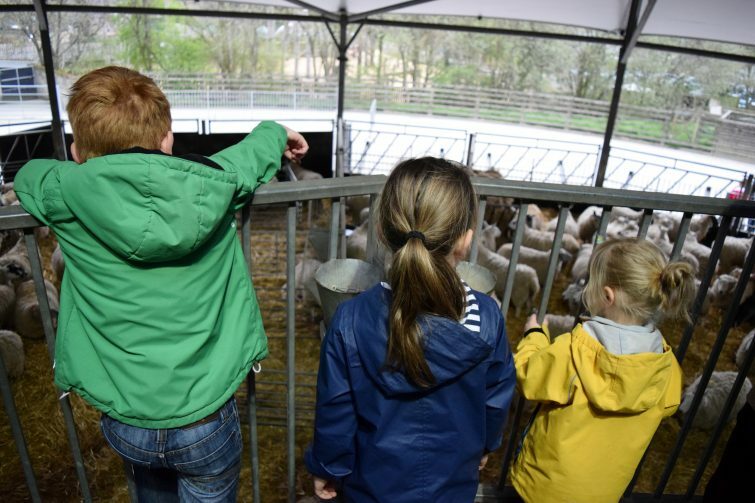 One of the main attractions of Smithills Open Farm for us is “Pet’s Corner” where you can feed and handle a variety of animals including the lambs and baby chicks! 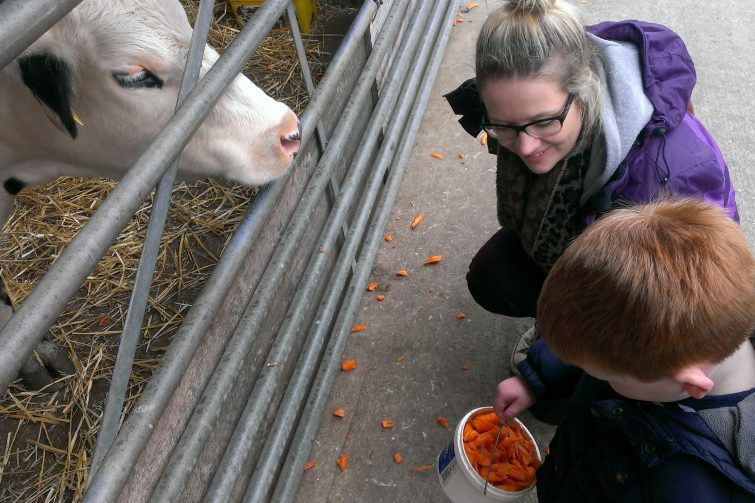 But, for Amy, the highlight of a visit to Smithills Open Farm is being able to watch her beloved cows be milked. Amy has been known to stand for a full 45 minutes watching a milking session! Smithills Open Farm have a cafe on site but you are welcome to take a picnic if you wish – there’s a number of picnic tables out near the play area and we’ve never struggled to find somewhere to sit. There’s an indoor area filled with bouncy castles and inflatables but we’ve always been too busy to use it! It’s also worth mentioning that there are donkey rides, you need to buy tickets for these at the kiosk but from memory they’re only a pound or so. It’s a long time since we’ve been to Reddish Vale Farm, near Stockport. So long in fact, that I was pregnant with Amy! It’s definitely time for us to plan a return. 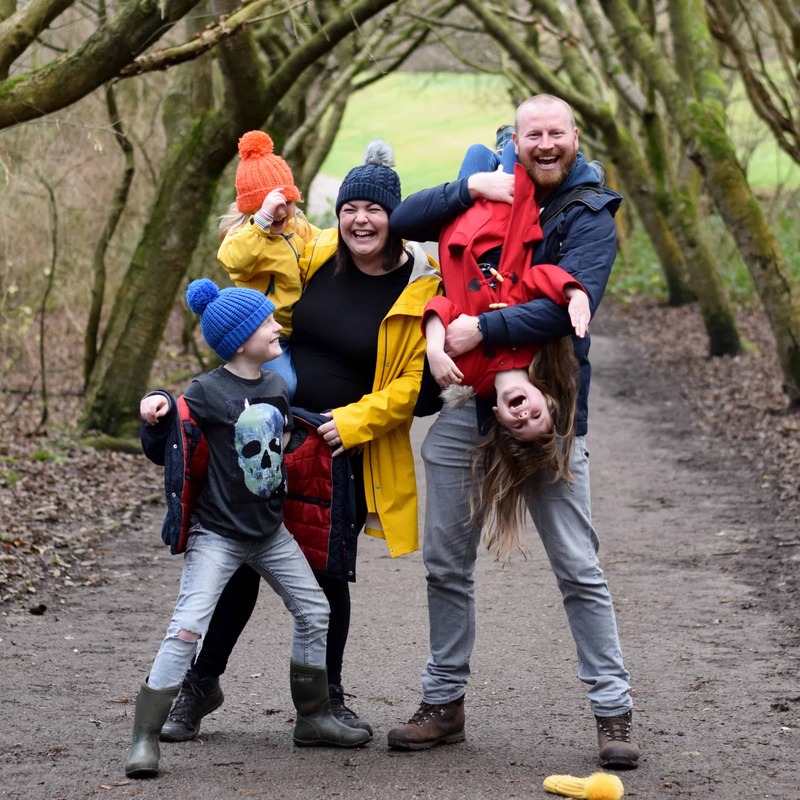 One of the things we loved most about Reddish Vale Farm is that it isn’t huge making it perfect for little legs to explore. You can buy a bucket of animal feed on your way in and feed many of the animals as well as petting them. 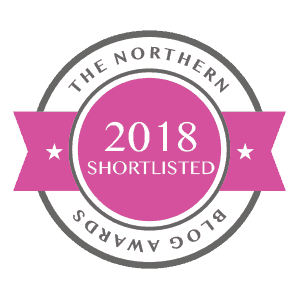 Once you’ve seen all the animals, there’s an outdoor play area as well as a covered soft play area with a bouncy castle to burn off some of that extra energy! The Reddish Vale Tea Rooms are perfectly placed next door for a hot drink and a snack or even for a full lunch. 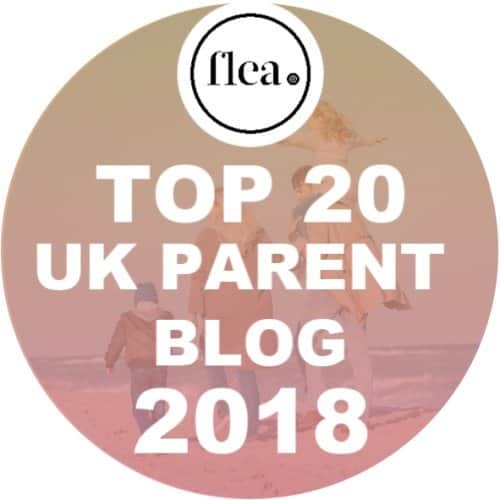 There’s so much to do at Canon Hall Farm with a number of outdoor play areas aimed at different ages of children (this is the first thing Ben mentions whenever we talk about Canon Hall Farm). The fairly recent addition of a soft play area was a big hit for us last year when it was really cold the day we visited – a chance to warm up with a hot drink while the kids ran around for a bit was a joy! 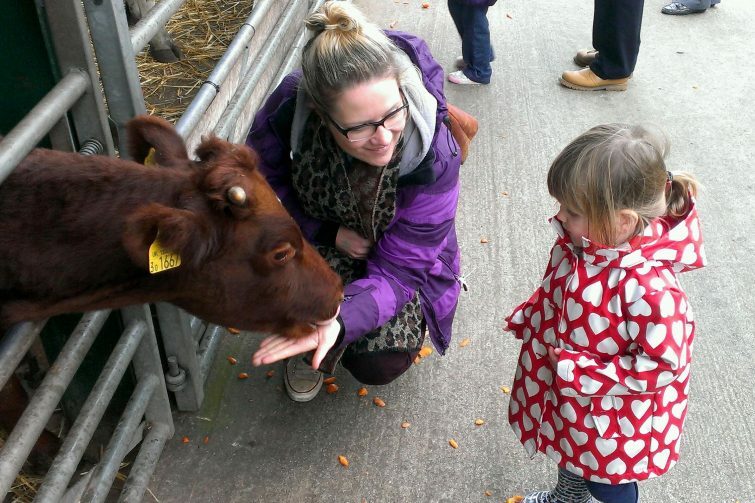 You can watch milking demonstrations – though this is usually just a couple of cows rather than a herd like at Smithills, take a tractor ride, pet some of the smaller animals and see all manner of baby animals at various stages from raised viewing platforms. For me, the raised viewing platforms are a game changer as it means that even the smallest visitor to Canon Hall Farm has a good chance of being able to see what’s going on! Will you be visiting a farm this spring? 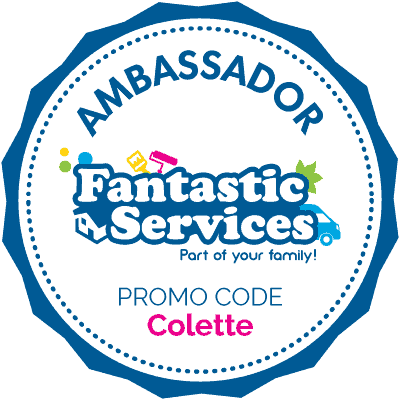 I’d love to know your favourites too! We used to love taking Freddie to the farm when he was younger. 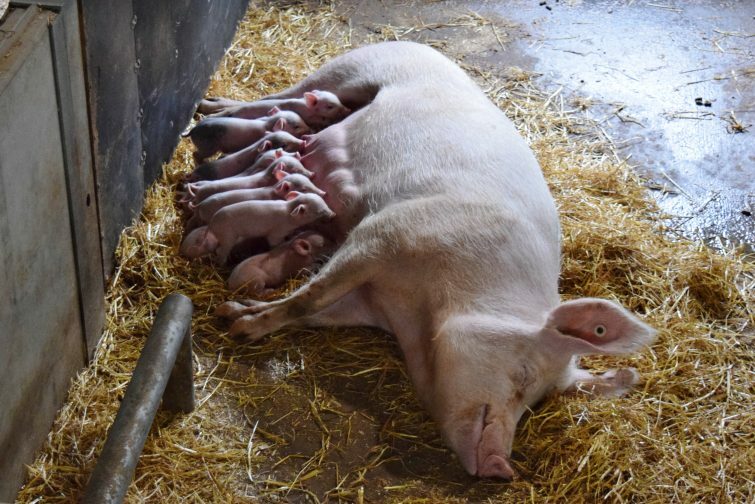 But we were never so lucky to see little piglets, they are just too adorable!